It all started when a loving mother posted a few pictures of her son, Beau, and their new puppy, Theo, napping together on her popular blog Momma’s Gone City. But these pictures were so "unbearably adorable" (The Daily Mail) and "utterly charming" (The Huffington Post) that it quickly became much, much more. By faithfully recording and sharing what Good Morning America calls "the most mesmerizing naps ever caught on camera," Jessica Shyba and her family captured the hearts of people all over the world, and these beautiful images of friendship and trust have become an international viral sensation. 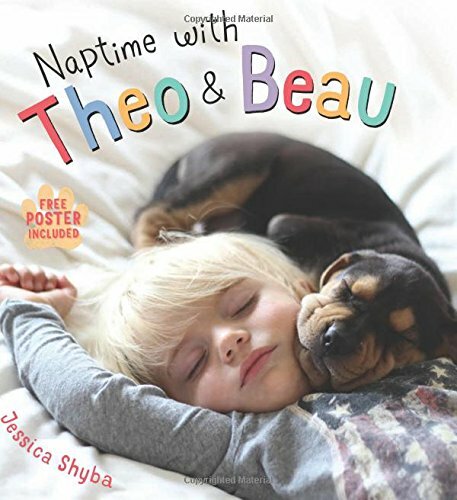 Interestingly enough, Naptime with Theo & Beau is authored by blogger Jessica Shyba, who publishes for Momma's Gone City. Jessica started photographing pictures of her son Beau and dog Theo during their daily naps. Those photos became a huge sensation and Jessica soon published a book featuring the noteworthy duo. There's not much more that can pull at a person's heartstrings than pictures of babies and puppies. Putting them both together brings definite "awwww" attentiveness. Naptime with Theo & Beau is page after page of adorableness. The hardcover book copy is 40 pages of cute photos with simple, short writing. It definitely tops the cuteness scale. Were you aware of Momma's Gone City blog? Which do you like more - babies or puppies? This is an adorable book. I'm putting it on my to read list!